Sleep apnea syndrome is common in patients with chronic heart failure, with prevalence from 40 to 76% 1. Both central and obstructive sleep apnea can occur and may lead to hypertension, heart failure, coronary artery disease and stroke[1-4]. Causes for these cardiovascular sequelae are increased sympathetic activity, increased negative thoracic pressure, systemic inflammation and release of vasoactive substances, leading to endothelial dysfunction[2,3]. We describe a patient with chronic heart failure and mainly obstructive sleep apneas who had near resolution of his apnea syndrome after implantation of a left ventricular assist device (LVAD). A 68-year-old male, with a hereditary dilated cardiomyopathy, implantable cardioverter-defibrillator and atrial fibrillation, noticed apneas during the night. These apneas occurred both in supine and non-supine position. The Epworth sleepiness score was 2. At the time of evaluation he also complained of fatigue and breathlessness on exertion (NYHA Class III). Physical examination revealed stable vital signs (blood pressure 110/80, pulse 70/min), an enlarged liver and a systolic cardiac murmur at the cardiac apex (2/6). Body-mass-index was 26 kg/m². The chest X-ray showed an enlarged heart without radiologic signs of fluid overload. Echocardiography findings consisted of left ventricular dilation with severe left ventricular dysfunction (ejection fraction 20%) and mild mitral valve regurgitation, dilated right ventricle with moderate right ventricular function and severe tricuspid valve regurgitation. Spirometry was normal. 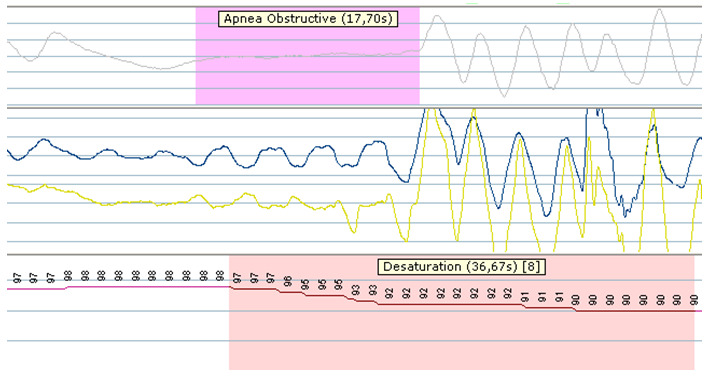 Polysomnography showed an apnea-hypopnea index of 44.3/hour with 19% hypopnea and 81% mainly obstructive apneas (see Figure 1). A transcutaneous nocturnal oxygen desaturation measurement showed a mean saturation of 91.5% (lowestof 73%). Continuous positive airway pressure (CPAP) was started. Figure 1: Polysomnographic recordings before LVAD implantation. It shows the presence of obstructive sleep apnea with cessation of air flow (upper panel) in association with slightly movement of the thorax and abdomen (middle panel), followed by desaturation (lower panel). Due to progressive heart failure, an LVAD was implanted 4 months later. This went uneventful and his hemodynamic situation improved considerably. During a follow up visit 2 months later, he reported that he no longer suffered from apneas and had stopped using his CPAP. Polysomnography(6 months after LVAD implantation) demonstrated an apnea-hypopnea index of 6.9/hour with stable oxygenation (90%) (see Figure 2). Body-mass-index was practically unchanged at 25.3 kg/m². Echocardiography showed improved left ventricular function (no estimate could be given) with mild tricuspid and mitral valve regurgitation. A year after the LVAD implantation, heart transplantation was performed and until this day forward (1.5 years after transplantation) he has not reported any apneas which was confirmed by his wife. His cardiac function is normal and he has no cardiac or pulmonary symptoms. Sleep apnea syndrome is common in chronic heart failure and can be treated with CPAP. Both central and obstructive sleep apnea can occur, predominantly central sleep apnea. CSA is characterized by impairment of respiratory drive during sleep. Normally, ventilation is regulated by a negative feedback system through peripheral and central chemoreceptors, which keeps the PaCO2 in normal ranges. In patients with chronic heart failure, a higher peripheral and central chemo sensitivity occurs with a lower apneic threshold during sleep which eventually leads to an exaggerated response to CO2[1,5,6]. If the PaCO2 decreases below the apneic threshold, breathing cessation occurs and when the PaCO2 raises again, ventilation resumes when PaCO2 level crosses the apneic threshold. Also delayed or prolonged feedback time (from the chemoreceptors) due to prolonged circulation time (a consequence of reduced cardiac output) in heart failure contribute to CSA[5-9]. Moreover, chronic heart failure leads to higher filling pressures causing pulmonary edema. Consequently, pulmonary stretch receptors (J receptors or C-fibers), located in the lung interstitium and alveolar walls, are being stretched in response to edema also leading to hyperventilation1,5. The PaCO2 drops below the apneic threshold and breathing cessation occurs. This process keeps repeating during the night, causing a crescendo-decrescendo pattern, Cheyne Stokes breathing. OSA is characterized by intermittent inspiratory airflow obstruction during sleep due to collapse of the upper (pharyngeal) airway leading to a pause in respiration with ongoing ventilatory effort. During that obstruction with cessation of airflow the PaCO2 rises and PaO2 decreases leading to stimulation of the ventilator effort and ultimately arousal from sleep to determinate the apnea. In most literature concerning heart failure, CSA occurs as a consequence of heart failure and OSA is thought to provoke or worsen heart failure. This case demonstrates that chronic heart failure may also initiate OSA probably through extracellular fluid overload. The first hypothesis is that nocturnal fluid shift of the lower extremities to the neck leads to pharyngeal edema and further narrowing of the pharynx. This hypothesis is supported by experimental observations that fluid displacement from the lower to upper body increases the neck circumference and pharyngeal resistance. In addition, patients with chronic heart failure and OSA respond well on diuretics and eventually demonstrate an improvement of their obstructive sleep apnea syndrome. Also during normal sleep, the activity of the upper airway muscles is decreased leading to some kind of mild obstruction.As said earlier, chronic heart failure leads to pulmonary edema leading to stimulation of thepulmonary stretch receptors. When stimulated, they do not only lead to hyperventilation (see explanation above, CSA), they also reduce the level of activity of the upper airway muscles9 which leads to further narrowing of the pharynx and thus to collapse and upper airway obstruction. In end stage heart failure, as a bridge-to-transplant, mechanical assist devices are being implanted. There are only five previous cases describing the effect of mechanical circulatory support on sleep apnea syndromes, with different outcomes. In three cases, with predominantly a central sleep apnea, there was no significant improvement of sleep apnea syndrome after implantation of a LVAD. One case showed resolution of CSA after LVAD implantation and another showed improvement of combined CSA and OSA after implantation of a biventricular assist device and CPAP could be stopped. We describe the first patient with almost complete resolution of his OSA after LVAD implantation. Most likely, the LVAD improved circulatory hemodynamics with less nocturnal fluid shifts and stretching of the pulmonary stretch receptors reducing pharyngeal narrowing. Sleep apnea syndromes are common in chronic heart failure. Our case shows that obstructive sleep apnea is indeed a consequence of chronic heart failure with near resolution after LVAD implantation. Awareness can offer other treatment modalities for an obstructive sleep apnea syndrome and prevent delay of diagnosis since higher morbidity and mortality are known in these patients. All authors report no financial conflict of interest. All authors report no financial or nonfinancial conflict of interest. No other contributions. 1. Sharma, B., Owens, R., Malhotra, A. Sleep in congestive heart failure. (2010) Med Clin N Am 94(3): 447- 464. 2. Gopalakrishnan, P., Tak, T. Obstructive sleep apnea and Cardiovascular disease. (2011) Cardiol Rev 19(6): 279- 290. 3. Somers, V.K., White, D.P., Amin ,R., et al. Sleep apnea and cardiovascular disease: an American Heart Association/american College Of Cardiology Foundation Scientific Statement from the American Heart Association Council for High Blood Pressure Research Professional Education Committee, Council on Clinical Cardiology, Stroke Council, and Council On Cardiovascular Nursing. In collaboration with the National Heart, Lung, and Blood Institute National Center on Sleep Disorders Research (National Institutes of Health). (2008) Circulation 118(10): 1080- 111. 4. Javaheri, S., Shukla ,R., Zeigler, H., et al. Central sleep apnea, right ventricular dysfunction, and low diastolic blood pressure are predictors of mortality in systolic heart failure. J Am Coll Cardiol (2007) 49(20): 2028- 2034. 5. Bordier, P. Sleep apnoea in patients with heart failure. Part I: diagnosis, definitions, prevalence, pathophysiology and haemodynamic consequences. (2009) Arch Cardiovasc dis 102(8-9): 651- 661. 6. Kee, K., Naughton, M.T. Heart failure and sleep-disorded breathing: mechanisms, consequences and treatment. (2009) Curr Opin Pulm Med 15(6): 565- 570. 7. Chiu, K.L., Ryan, C.M., Shiota, S., et al. Fluid shift by lower body positive pressure increases pharyngeal resistance in healthy subjects. (2006) Am J Respir Crit Care Med 174(12): 1378- 1383. 9. Berne, R., Levy, M. Physiology (fourth edition,) (1998). 10. Padeletti, M., Henriquez, A., Mancini, D.M., et al. Persistence of cheyne-stokes breathing after left ventricular assist device implantation in patients with acutely decompensates end-stage heart failure. (2007) J heart lung transplant 26(7): 742- 744. 11. Vazir, A., Hastings, P.C., Morrell, M.J., et al. 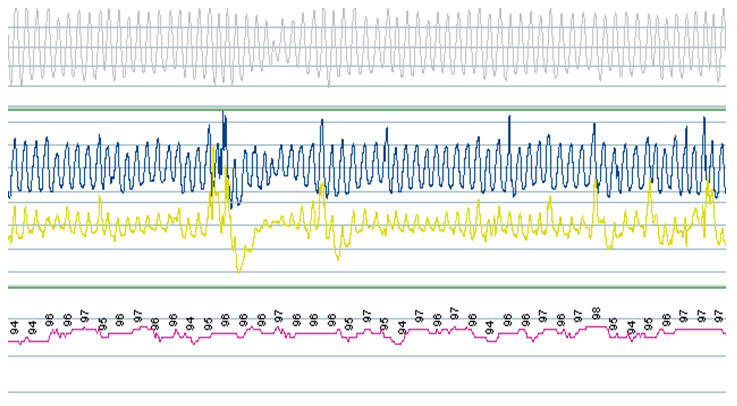 Resolution of central sleep apnoea following implantation of a left ventricular assist device. (2010) Int J Cardiol 138(4): 317- 319. 12. Vermes, E., Fonkoua, H., Kirsch, M., et al. Resolution of sleep-disordered breathing with a biventricular assist device and recurrence after heart transplantation. (2009) J Clin Sleep Med 5(3): 248- 250.